There are a few things to think about before you start putting pen to paper or ordering that cute floral invite you're lusting after. Firstly what type of wedding are you having? If you’re having a formal black tie bash, then you’ll have to follow suit with a more formal tone for your wedding invite. 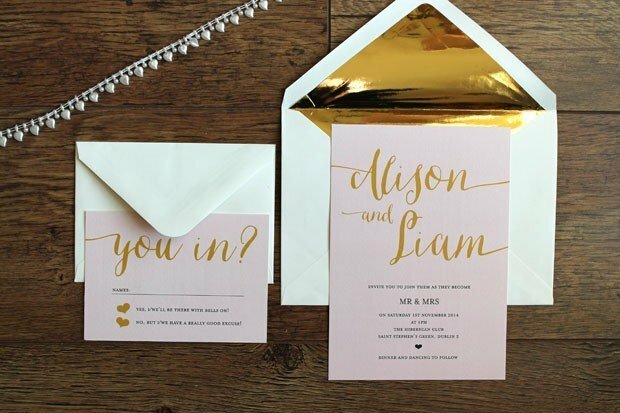 Whereas if it’s a back yard garden party you’re throwing, you can relax a bit and have a much more casual and informal tone for your wedding invitations. Traditionally the parents ‘hosted’ and paid for a chunk of the wedding which is where the wording 'Mr & Mrs X request the pleasure of your company' comes from but with couples sharing or paying the majority of the wedding costs, wording is changing to follow suit. You’ll need to decide who wants to take the lead on the invite, do you want to go 50/50 and include your parents on the wedding invite or would you like to invite guests yourself. Unfortunately family issues may pop up in the midst of your planning particularly when it comes to wording your invites. If it’s you and your other half taking the lead on the invite, then crisis averted, but if your parents are separated or divorced and other partners would like to be included, a lovely way to avoid any awkwardness or hurt feelings is by using the wording: 'Together with their Families, X and X would like to invite you to celebrate their wedding day...'. Be clear on your invitation and print only the names of exactly who is invited. Add “Adults Reception to Follow”.